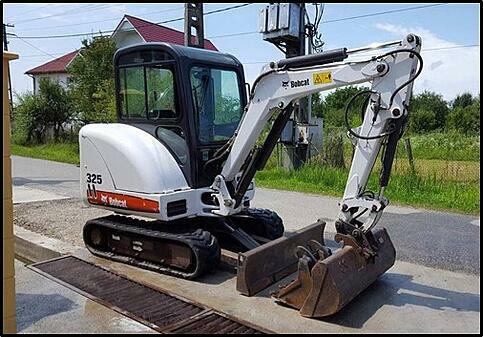 In the video above, you see the rotator group that was removed from a Bobcat 325 mini-excavator. Not only is the rotator group one of the most critical assemblies in a track drive motor, but it is also one of the most expensive to replace. Let's talk about the most important parts that make up a rotator group: cylinder block, valve plate, pistons, piston shoes, retainer plate, and the swash plate. The individual components are labeled in the image below. The ports on the bottom of the cylinder block (aka, piston block) work in conjunction with the valve plate (aka, distributor plate) to distribute the hydraulic fluid to different pistons. Hydraulic fluid enters under high pressure at the base of the piston cylinder and exits the tiny hole that is visible on the piston shoe. The pressure of the hydraulic fluid is what causes the piston to move. As it moves, the piston shoe presses against the swash plate. That motion causes the piston block to rotate. The rotator group meshes with the lower drive shaft in the center of the piston block. As the piston block rotates, the lower drive shaft also rotates. The piston shoes are supposed to have a smooth surface. If the shoes are scarred, then you have a problem. Also, there should be minimal pop (or play) between the piston shoe and the piston if you pull outward on the piston shoe. An even worse sign would be piston shoes no longer connected to the pistons -- as you can see in this picture. Obviously, the rotator group on the left has been torn up pretty badly. The one on the right is brand new and shown for comparison. Swash plates should also have a smooth surface. Scratches and grooves are signs of excessive wear and will cause your final drive to be less efficient. If the retaining plate has scratches, then there is a good probability that the piston shoes are too loose where they connect with the piston cylinders. Sometimes the lower drive shaft can break. If the break looks cone-shaped, then it was a torsion-related break. The valve plate can also show signs of wear. A worn valve plate with have scratches and scarring and may have a smeared appearance. Believe it or not, it’s not that difficult to prevent this type of damage to the rotator group. The main cause of rotator group failure is contaminated hydraulic fluid. 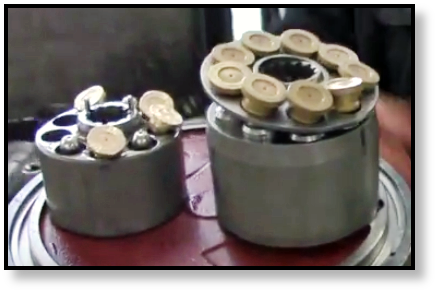 The damage in this video was caused by hydraulic contamination. Change the hydraulic fluid in your machine according to the schedule recommended by your manufacturer (in this case, it would be Bobcat). You also need to replace the hydraulic filters on schedule, which includes the case drain filter. Case drain filters should be replaced every 300-500 hours of machine operation, or else your final drives may experience catastrophic damage! Whether you have a travel motor from a Bobcat 325 or some other type of final drive, hydraulic contamination can cause significant problems and even total your final drive. In this particular example, we saw the extensive damage it caused to the rotator group. Don't let this happen to your final drive!